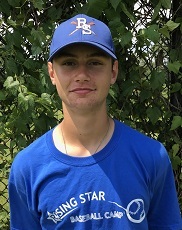 Justin Perlman began coaching at Rising Star Baseball Camp in 2017. As a camper, Coach Perlman earned the prestigious Tom Koehler Pitcher of the Week Award. He is a pitcher on the Pleasantville High School Baseball Team where he graduates in 2019. Coach Perlman teaches basic fundamentals to campers on the Rookie Field at camp.